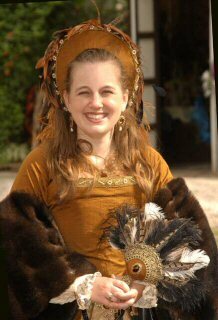 Returning to Scarborough Faire for the second progress, Lady Mary, daughter of Charles Brandon, Duke of Suffolk was working on lining up fiancés in case her fifth fiancé met the same fate as the first four. 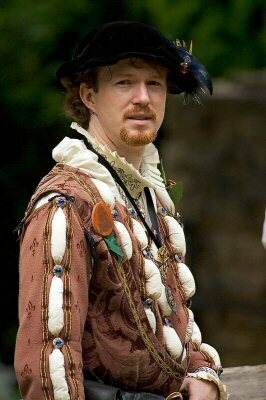 Sir Anthony, English Ambassador to France was once again in Scarborough reporting the latest intrigues from the French Court to King Henry VIII--as well was enjoying a little bit of gambling and fighting magician duels for the King. 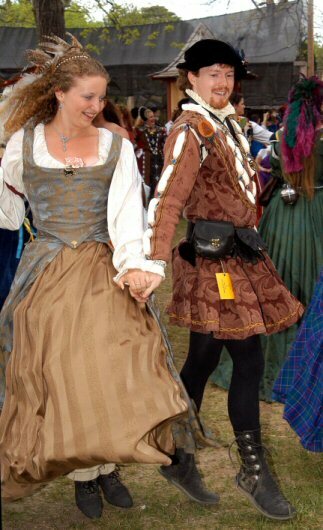 As we were last year, we were paired for the Morning Court Dance Show. It's very difficult to remember to dance these flirtatious dances as "Uncle" and "Niece" instead of husband and wife. To assist with this, we spent most of this showcase dance making humorous comments to each other while passing back and forth. 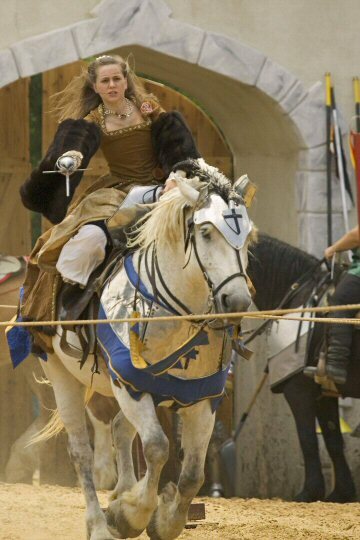 Lady Mary learned how to ride horses in the jousting games this season. 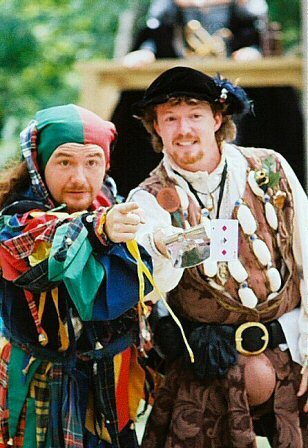 Sir Anthony engaged Donk the Jester in a very entertaining Magical Duel during the chess match. Sir Anthony was inducted into the Order of the Garter by King Henry VIII. This seemed to be the year of the great hat swaps. Everyone seemed to be stealing and switching hats. 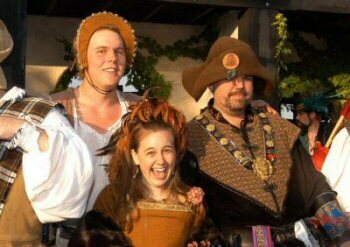 Lady Mary's looked quite stunning on Bob the Scarecrow and even better on Lord Somerset although that one was not captured on film. 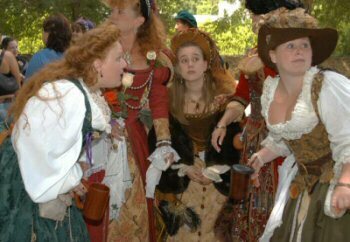 The International Tour de Force (Lady Bremerton, Lady Mary, and Graffina Natasha--center three ladies) brought back the Chicken Gossip Huddle bringing in extra ladies when necessary. 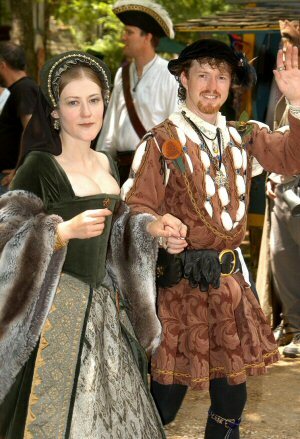 Sir Anthony enjoyed dancing the Petite Riense with the energetic Lady Josceline. 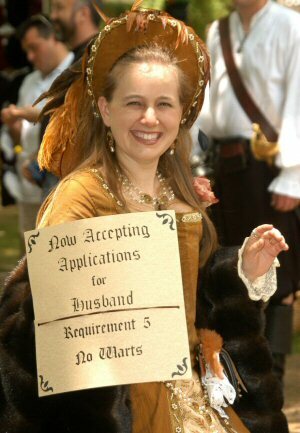 Lady Mary brought out the signs again this year modifying them from working to seeking a husband and her requirements for a good one. 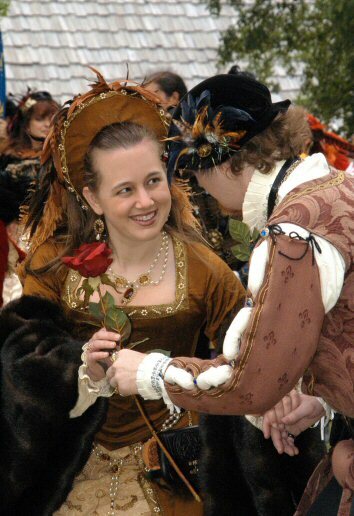 Sir Anthony walked with various women including the Countess Derby during parade.